If you’ve ever played Sheriff Gaming’s superb trip into panto-land, Alawin, complete with animated flying carpets, clean-cut Aladdin heroes and beautiful princesses, you’ll know that the classic tale of a street urchin hitting it rich is one that translates perfectly to online slots. Slot developer Real-Time Gaming have gotten in on the act with their slice of genie genius – Aladdin’s Wishes. A 5 reel, 20 payline video slot, it comes complete with the requisite magic carpets, genie’s lamps, temples, princesses, razor-sharp scimitars, and Aladdin himself on the reels. And with bets starting at a wallet-friendly $0.01, going up to a maximum bet of $100, this game caters for all betting budgets. Aladdin is Wild and Doubles Wins! The Wild in Aladdin’s Wishes is the Aladdin symbol. He only appears on reels 2, 3 and 4 and substitutes for all regular symbols other than the Scatters. Winning combos including a Wild are doubled. The game’s Scatter is the Genie’s lamp, and rubbing this up the right way can lead to some serious wins. 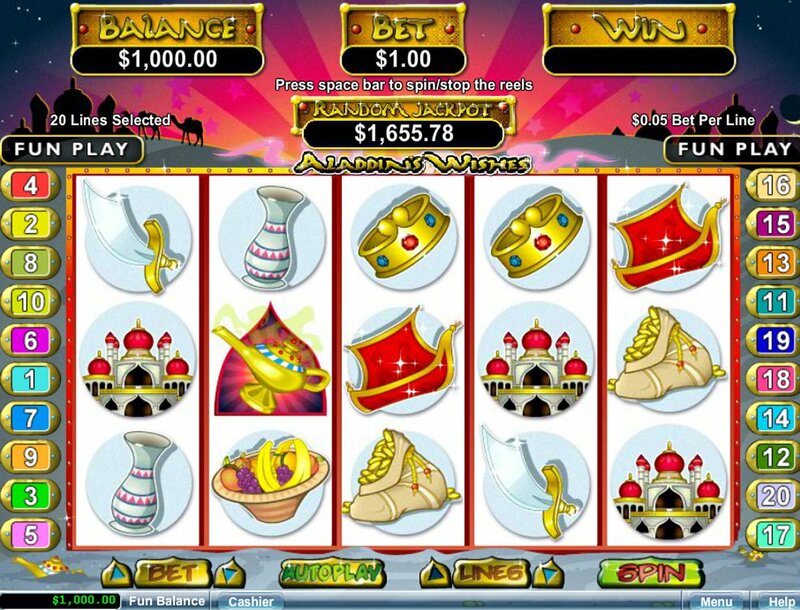 Three Scatters anywhere launches a lovely free spins round. First you’ll have a series of five lamps to click on in order to find out your win. 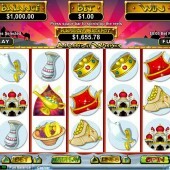 Each lamp contains a different prize, and you can win up to 25 free spins. You’ll also have the chance to win a multiplier to go with them, anything from 2x to 100x. You Can Also Re-Trigger the Free Spins! Not only that, but during the free spins round you can re-trigger the bonus, and I found this happening to me quite a lot (maybe I was just lucky). So, if you manage a free spins round with 50 spins, that can prove to be a very lovely bonus haul indeed. As well as a tasty bonus round, there’s a progressive jackpot or three to be had. These can be triggered anytime, and best of all, you don’t have to be betting the maximum in order to hit it, unlike some other progressive jackpots around. In terms of Arabesque-themed slots, Aladdin’s Wishes won’t exactly float the boats of slots fans who are used to slick, 3D graphics and smooth gameplay. It is not exactly a millionaire maker like NetEnt's mesmerizing Arabian Nights either. But for a no-nonsense slots experience with some truly awesome potential wins, it’s hard to look past RTG’s offering.